Finally I got around to making up one of Gertie’s fabulous vintage patterns from her Gertie’s Ultimate Dress Book. It wasn’t until Gertie came out to Australia and had a soiree in Melbourne that I got my act together to make one. You know how it is, too many ideas not enough time! I thought if I’m going to meet Gertie I have to at least wear one of her dresses. Threadden hosted the soiree which was held on Melbourne Cup Day at Madame Brussels in Melbourne, a perfect location for a Gertie soiree. Madame Brussels is a 50’s inspired inner city bar found on the rooftop overlooking Melbourne. As they describe it, think Peggy Gugenheim in the 50s, in a Palazzo on the Venetian Grand Canal. Famous for their high teas and cocktails and set amongst astro turf, garden seats and twirly wurly furniture. A very grand location for such a grand event! There are so many gorgeous vintage designs in Gertie’s book it was very hard to choose one but I decided on the halter neck dress as it took less fabric and I only had a weekend to make it. The fabric is also a Gertie fabric from Spotlight in Melbourne. There’s something about sewing a boned bodice that is very satisfying. I feel like a real “seamstress” when I create such couture pieces. I couldn’t find any steel boning so just went with the readily available plastic boning. It worked out really well and I’m very pleased with the result. 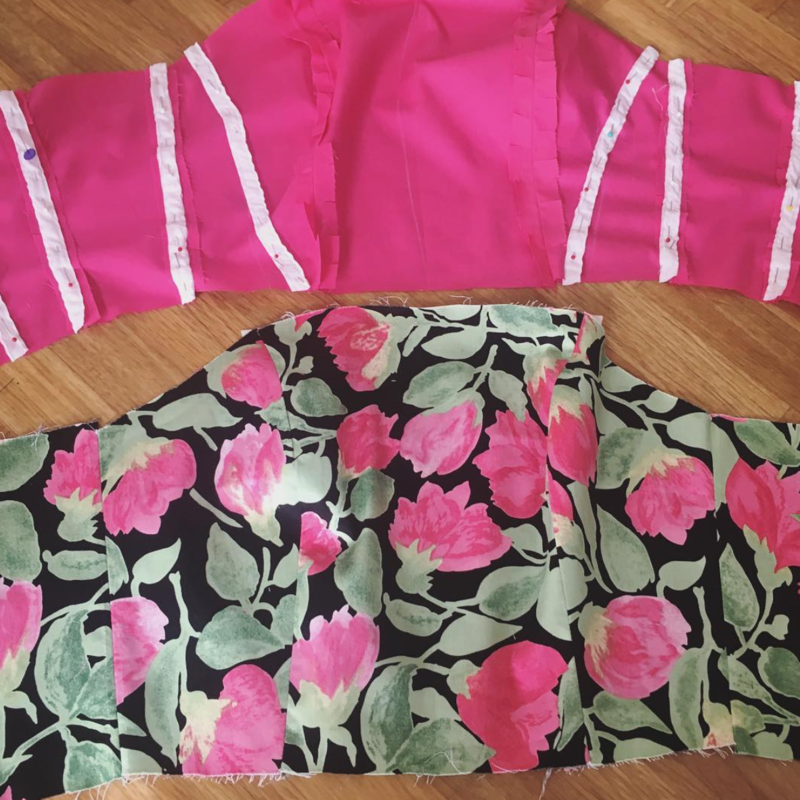 The dress is fully lined in lining I had left over from my Lincraft Spring Racing dress. As much as I love buying fabric it’s always a bonus when you don’t have to buy more 😉 The instructions are pretty straight forward although I wouldn’t recommend it to a beginner. No alterations were necessary (another bonus) however, I did unpick the lapped zipper about three times as I just couldn’t get it perfect. My bright pink bag and shoes I had bought to go with my Lincraft Dress worked perfectly as accessories along with my hand painted rose for my hair. 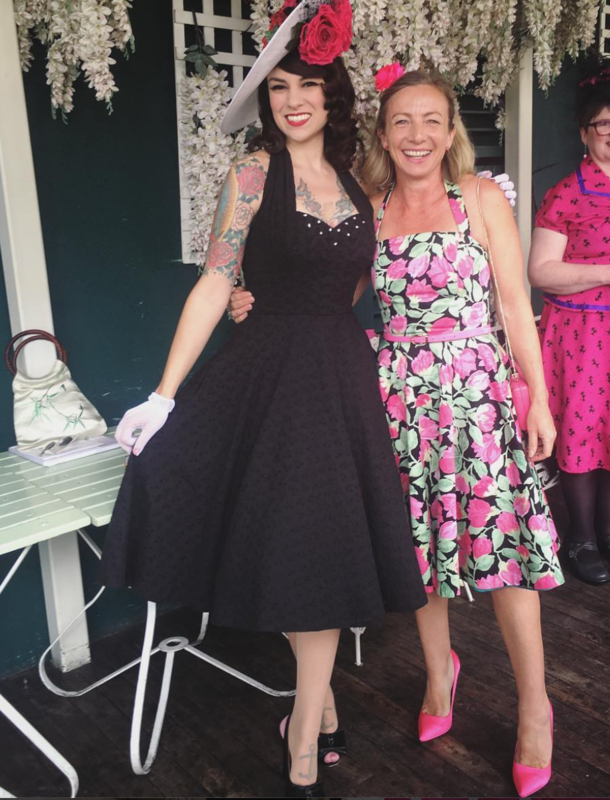 It was such a lovely soiree, so many inspiring sewers and I met Gertie who looked absolutely amazing in her black Lamour Dress. I went out immediately afterwards to purchase some black eyelet fabric to copy her dress. Thanks to Thread Den for hosting a fabulous day and to Gertie for visiting and sharing her new Charmed patterns. I can’t wait to make up more Gertie patterns. 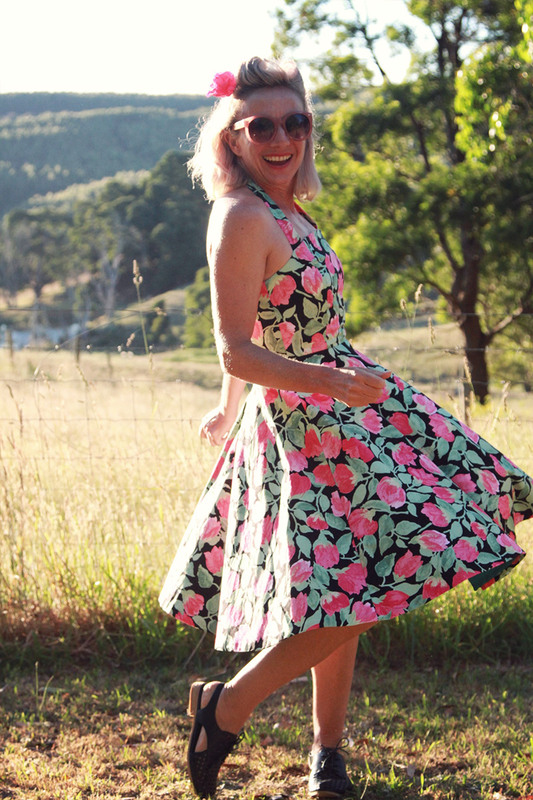 This entry was posted by Annie in DIY, fifties style, vintage and tagged dress, gertie, sew this pattern, sewing, threadden, vintage. Hi annie can you recommend any woven fabric shops please in australia? So sorry, I just found your comment in my “pending” file…not sure why it was there. The best fabric shops that I shop at for woven are Darn Cheap Fabrics (not as cheap as they sound), The Fabric Store (you have in NZ also), Tessuti Fabric and of course Spotlight. Spotlight has a huge variety of fabric. Sometimes the quality can be questionable, but I find the sateens and wovens there quite good. I hope this helps even if it is a little late! Beautiful job….looks lovely on you! Thankyou. I love the skirt, it feels fantastic on.